Microsoft Security Essentials for Windows XP - product for comprehensive anti-virus protection. The application uses tight integration with the operating system environment, uses a constantly updated database of various spyware and virus threats, contains a protection module of the integrated Windows browser and its own scheduler to set the time for a full scan. The program uses an intuitive graphical interface with color indication of the state, consumes a small amount of resources for download and operation. Antivirus contains a minimum of settings and includes the ability to add exceptions to run. 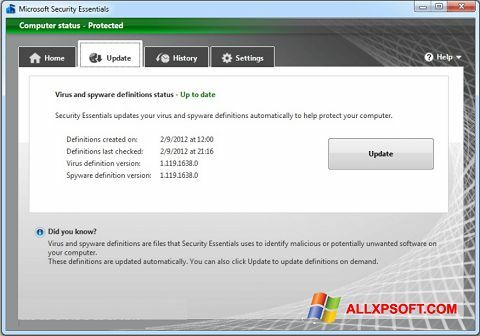 You can free download Microsoft Security Essentials official latest version for Windows XP in English.